About five years ago, I bought 3 thorn-less blackberry plants. When they arrived they were just sticks with roots at one end from a popular mail order company. I actually prefer buying plants this way as they are inexpensive and I don’t feel as bad when they don’t survive during the first year of planting. I vaguely remember a tag on the stick that stated that they would only produce berries for a limited time period, like 5 years. So with that said, I planted them anyway. No fruit was produced the first or second year, and the plants became bushier and bushier. So the next year, there were flowers in June and bright fuchsia colored berries appeared in July. This made me think, that I must have planted raspberries, that is until I tasted one. Yikes! SOUR! So the berries remained this color for the whole month of July. They also during that time grew large and plump. I tasted them at this stage as well. They were just as nasty but more tender. 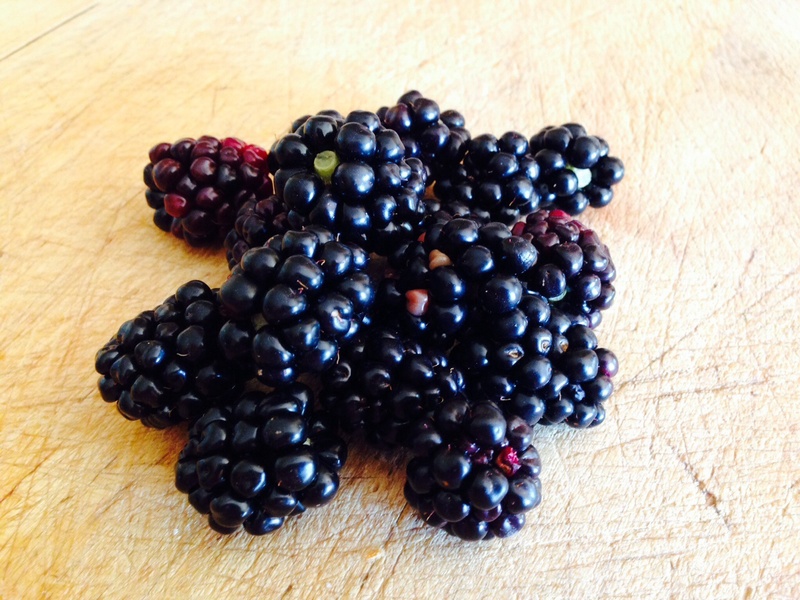 At the first week of August some of the berries turned black, however they were still sour. I thought, what the? Another week went by and that is when the ants arrived in droves all over the blackberry plants. Every blackberry had at least two ants harvesting the fluid and flesh of the lobes. Finally the berries were sweet! The ants are the sign I was looking for! Only problem was the ants. So my answer to that problem then, and still is at present, is to pick the berries and place them in a resealable bag with a quarter cup of Amaretto liqueur. The liqueur not only makes the berries taste incredible but it kills the ants and any other bugs too. 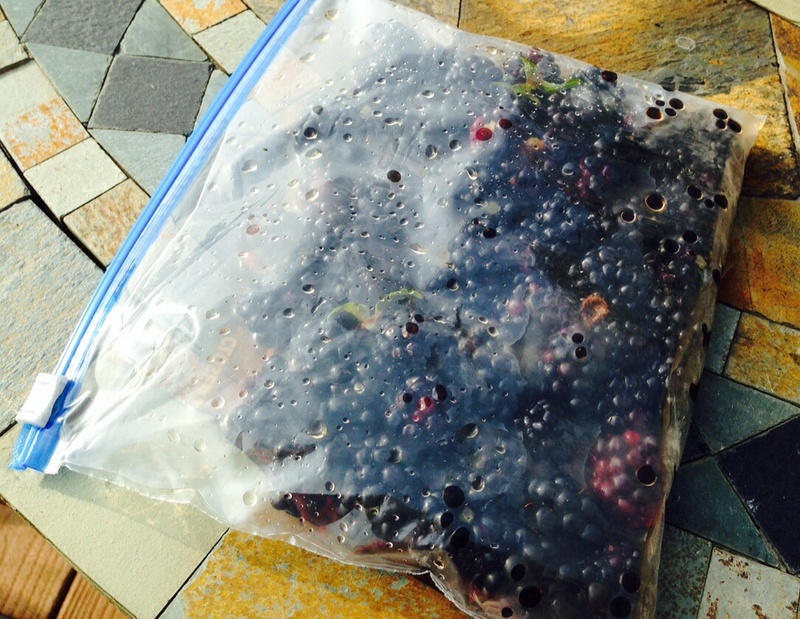 And each day for a week I placed the picked black colored berries in the bag, refrigerating them each day. When the bag is full, I wash the berries with water to wash away the bug bodies. Then I place them in a fresh bag with 3 tablespoons of Amaretto. The fruit absorbs the Amaretto just enough to make them a perfect little yummy snack as is, or my MIL Fran cooks them down on a low flame for about 30 minutes stirring every 5 minutes or so. This makes an amazing sauce for drizzling over ice cream, yogurt or to serve with duck. For those who don’t like the seeds, you can push the blackberry sauce through a sieve. The sauce is only as sweet as the berries and may taste tart-ish by itself.